Actress Sunny Leone is filling up Instagram with some beautiful pictures from the sets of her biopic Karenjit Kaur. The recent posts are dedicated to her co-stars Bijay Anand and Grusha Kapoor, who played the actress' parents. In two different posts, Sunny expresses her gratitude towards them. "Grusha Kapoor, who had the enormous task of filling the shoes of a woman I miss will all my heart and soul. Every time I saw her, my heart would break seeing my mother in her character. Truly an amazing actress," she captioned her post for the actress. 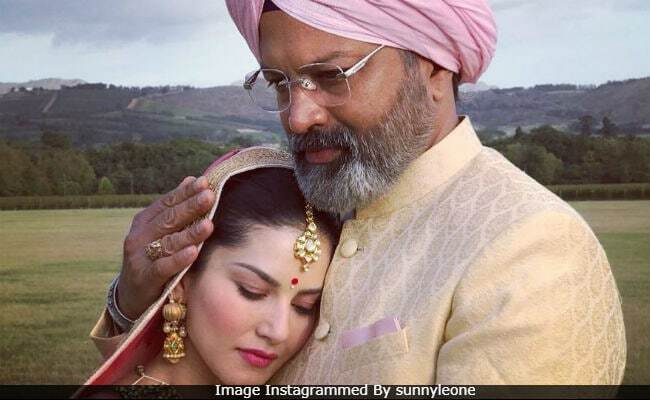 Meanwhile, for Bijay Anand, Sunny Leone wrote, "Such an amazing journey with the amazing actor who played my father in Karenjit Kaur. I can't express enough gratitude for what you have done." Take a look at Sunny Leone's posts here. Karenjit Kaur: The Untold Story Of Sunny Leone is a biopic on the actress, which was made in the form of a series. Actor Marc Buckner plays her husband. Earlier this week, Sunny had shared a couple of pictures with him from their wedding sequence, along with a link to their biopic's song. Sunny's post got a heart-warming reply from her husband Daniel Weber, who tweeted: "There is so much emotion for me watching this video from the Karenjit Kaur biopic. What a life we have lived so far! Sunny Leone, love you forever! So much more to accomplish together still!" Sunny Leone and Daniel Weber married in 2011.They are parents to two-year-old Nisha and twin boys Noah and Asher. They adopted Nisha from an orphanage in July 2017 while Noah and Asher were born via surrogacy in March this year. The first season of Karenjit Kaur series released in July while the second season is slated to premiere on September 18 on ZEE5.